Apartment of about 200 square meters, on the first floor. It can accommodate up to 10 people and it�s composed of a large entrance hallway, 3 bedrooms, 2 bathrooms, a livable kitchen, a large room with dining room and 4 terraces. Air conditioning, heating and internet Wi-Fi are free. Residenza Oltrarno is situated on the first floor of a nice Florentine building of the thirties: it�s an apartment of about 200 square meters and, as you can see from the pictures, it�s large, bright, well appointed with beautiful furniture and blended with today�s modern conveniences. In it, you will have a lot of space and comfort, so you can feel at home even when you travel. The apartment is located just outside the ZTL (Restricted Traffic Area), only 500 meters far from the historic centre of Florence; it can accommodate up to 10 people and it�s composed of an entrance hallway, a large dining room with living area (for reading and watching tv), 3 bedrooms (all equipped with conditioned air and heating, both adjustable independently) and two bathrooms. All rooms are very quiet as they are provided with double glasses and double windows that guard the secret of the true rest. 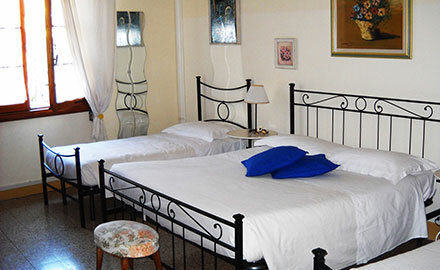 Of the three rooms, the room named �San Frediano� has a double bed and two single beds; the room �Santo Spirito� (with balcony) and the room �San Niccol� (with a small patio) have a double bed and a single bed, with orthopedic quality mattress and bed base. Of the two bathrooms, the green one has a bathtub with shower use, while the pink one has a shower with facilities for disabled people and/or old persons and children. The spacious kitchen is equipped with all the utensils necessary to prepare good lunches and dinners. Moreover, even the kitchen has a lovely balcony overlooking the inner part of the building, which is very reserved and quiet. The living area consists of two rooms: the dining room with an oval table that can allow to sit up to 10 people and a large sitting room with a comfortable three seater sofa and two armchairs, where you can enjoy a cup of coffee or a drink or relax yourselves reading a book. The living area is completed by a terrace furnished with chairs and small tables and overlooks the adjacent square (Piazza Pier Vettori). Internet Wi-Fi line in the apartment is included in the price. It�s possible to park your car outside the Florentine limited traffic zone (ZTL) of the historic centre of Florence: the cost is 10 Euro every 24 hours. The distance of the Residenza Oltrarno from the historic centre is 500 metres (as the crow flies). 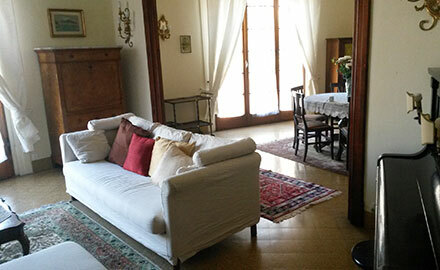 Residenza Oltrarno is well connected with Santa Maria Novella railway station and the city airport. Nearby you can find very good restaurants and typical Florentine taverns. The B&B is composed of 3 bedrooms of various types (in various combinations they can accommodate up to 10 people), 2 bathrooms, a spacious kitchen, an entrance hallway, a dining and a living room. Air conditioning, heating and internet Wi-Fi are free. Family room, composed of 2 bedrooms (2 king size beds and 2 single beds). the pink bathroom has a shower and facilities for disabled people. A large living zone, where you can relax yourselves reading or watching tv. For breakfast we use the products of bar and confectionery shops which has an arrangement with us.